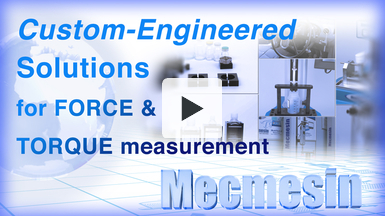 For over 40 years, Mecmesin has been supplying force and torque test equipment to customers worldwide, reflecting our commitment to both customer satisfaction and user-focused product development. Our team of application engineers has many years experience in providing solutions to our customers' force and torque testing applications. Whether you are from a production, R&D or educational environment, we can help you find the solution to meet your application and budget. As well as our standardised products, we are often called upon to design bespoke force test solutions for specialist applications. Our special applications team can design and manufacture bespoke test machines and innovative grips and fixtures to your exact requirements. We can ensure your testing complies fully with relevant international and national standards and in-house specifications e.g. ASTM, BSI, DIN and ISO. We have an impressive track record of finding solutions to the most unusual test applications and our applications database covers a wide range of industries including aerospace, automotive, construction, cosmetics, electrical and electronics, food, manual handling, medical devices, packaging, paper and board, pharmaceuticals, plastics and rubber, safety, sports and textiles. We have provided our customers with a diverse range of test solutions e.g. a system for repetitive penetration testing of plasterboard, a specialised fixture for positioning a PCB at 45º and 180º to comply with the specified test standards and a syringe pump calibrator to test for blockages in safety critical syringe pump infusion systems, to name but a few! Please visit our test solutions and testimonials areas to see more examples of how we have helped our customers with specialised test solutions. If you would like advice on your test application please call us on +44 (0) 1403 799979, fill in our enquiry form or request a callback. One of our applications engineers will contact you to discuss your requirements.